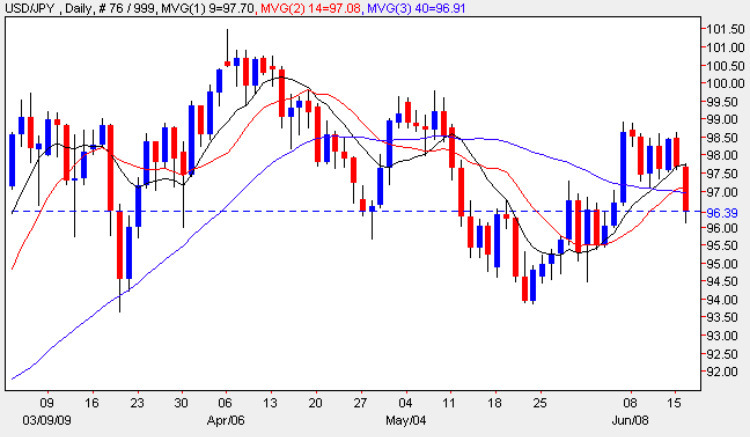 The overnight statement from the Bank of Japan, and its decision to leave interest rates on hold, finally injected some much needed momentum into the dollar yen pair today with a significant down wards move which has now breached all three moving averages and is currently trading marginally above the 96 price region. In its statement the Bank reiterated its view that the Japan’s deepest post war recession is easing evidenced by improvements in exports and industrial output for the second month running, and as a result kept overnight lending at the current rate of 0.10%. According to Gov Masaaki Shirakawa in the next few months he sees signs that Japan’s economy will show clear evidence of bottoming out as conditions gradually begin to improve for the battered export market. From a technical perspective we must now await to see whether this injection of momentum converts into a meaningful price trend or is simply reversed. Whilst it may be easy to assume that having broken through the moving averages this gives us a clear trading signal, in fact this may be far from the truth since any minor move would achieve this since all three moving averages are tightly bunched following the weeks of sideways consolidation. This trend will only be confirmed once we see a sustained break and hold below the 94 price region and should this occur in due course then we may even see a deeper move back to re-test support in the 89 to 91 price area. All the fundamental news relating to the US dollar is covered on the Eurodollar site.